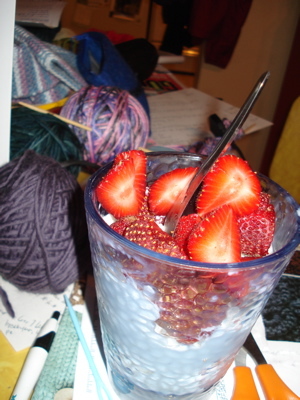 I was tired yesterday — too tired to really focus on most of what I am working on — so instead, I did some knit-tidying. You know what I mean. One of the bibs I finished a few weeks ago still needed…something. I added a deep teal flower to match the button. 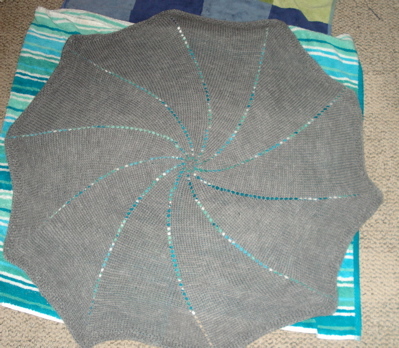 Then, I wove in the ends of the pinwheel blanket, and laid it out to block on my bedroom floor. This entry was posted in knitting and tagged baby bib o'love, blocking, embroidery, ice cream, pinwheel by barefootrooster. Bookmark the permalink. Your pinwheel blanket came out beautifully! 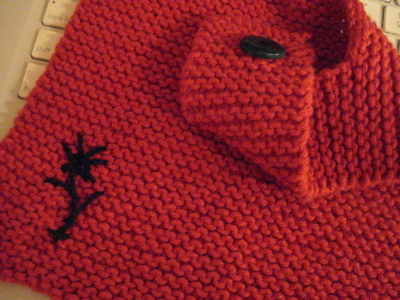 I made one of those and it was so fun to knit up. The bib is so cute with the embroidered flower too! And the strawberries look gorgeous.